This item is included in our Captain Puget Fan Kit - a great gift for a Captain Puget fan! See Other Products. This is not an Exploration Northwest episode. 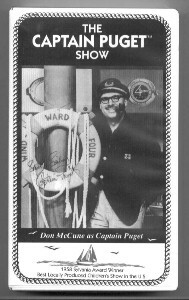 The Captain Puget Show sailed the television airwaves from 1957 to 1966, winning the national Sylvania Award in 1958 for the "Best Locally-Produced Children's Show in the Nation." The Emmys did not exist at that time; the Sylvania Award was the equivalent of a national Emmy today. 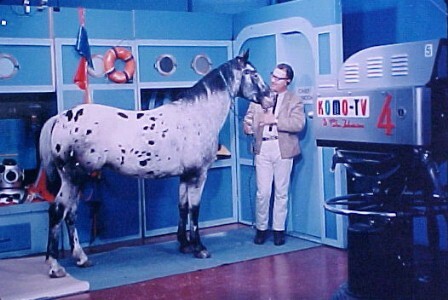 Aboard the studio schooner WINDWARD 4, Captain Puget™ sailed live each weekday afternoon on KOMO TV, channel 4, singing sea chanteys and taking youngsters on filmed adventures. Ivar Haglund is seen as First Mate "Salty" and Captain Puget™ wrestles an octopus underwater! This 30-minute black-and-white program was re-created by tenderly restoring and digitizing the original 1958 kinescope, the only recorded program out of more than 2,400 live broadcasts! Clutch Cargo and his pals Spinner and Paddlefoot crash-land their plane near an abandoned Indian village. Blast off with Scott McCloud as Space Angel along with Taurus and Crystal for this adventure into outer space where they encounter unidentified signals that jam communications! Aboard their ship Starduster, they find the source of the signals and reunite a long-lost scientist with his family.